Compost toilets, if you haven’t already figured this out from context clues, are toilets that collect your waste and break it down into compost rather than using a plumbing system like we have in NYC to sweep everything away into a septic system or a sewage grid. You simply remove the dry compost from the toilet a couple of times a year. But, the idea of waste being swept far, far away just seems much more comforting than the thought of it being naturally broken down inside one’s own home. It turns out, however, that compost toilets are – and I can’t believe I’m saying this – not gross. I spoke to Fraser Sneddon, manager of the Sun-Mar Corporation, and immediately got down to the most important question: Do compost toilets smell? I figured if the answer to that question was yes, there wasn’t much need for any other questions. The vent stacks, which lead to outside of wherever the toilet is housed, create negative pressure inside the toilet forcing air to always travel outwards . Some do this by relying on the natural air movement outside, while others have a continuously running fan to help things along. In addition, Sun-Mar provides their customers with an additive called Compo-Sure (clever name) to ensure that your waste decomposes using aerobic bacteria rather than anaerobic bacteria. It turns out that the smell you imagine when you think of rotting human waste (which I’m sure you do regularly) is mostly caused by gases released by anaerobic bacteria. I also watched a few videos online about compost toilets; everyone seems to be in agreement that odor is not really a factor. Although, one person in a video did refer to a compost toilet as “essentially a human kitty litter box.” So, obviously, I then asked Fraser Sneddon why his company didn’t also make compost kitty litter boxes. I have no doubt that the handlebar mustache wearing youth who reside in my Brooklyn neighborhood would waste no time buying a compost kitty litter box they could use to help fertilize their roof top gardens where they grow thyme and have kombucha parties. Fraser politely chuckled and responded that it’s something Sun-Mar might be interested in for the future. Frankly, I don’t think he took my idea all that seriously. But, Fraser went on to describe some other instances where a compost toilet absolutely makes sense. “In North America, close to 25% of the population is on septic systems. 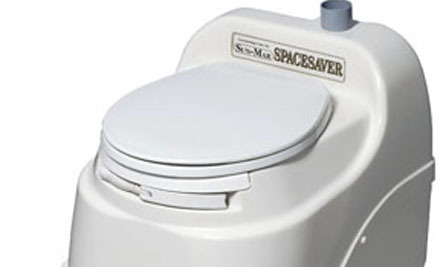 Septic systems don’t last forever.” A compost toilet, because it is self-contained, can relieve pressure on and greatly extend the life of an existing septic system. Also, in places with no easy access to pre-existing plumbing, compost toilets are an obvious choice. For example, if you were to build a pool shed in your back yard, and didn’t want to go through the process of linking that shed to your piping system, you could simply have a compost toilet installed in as little as half an hour. Even if your house is fully plumbed, a compost toilet might be a good option if you have an elderly parent move into your house and you want to install a toilet closer to their bedroom without re-piping your house. On top of their practical uses, compost toilets are also just more efficient than a standard toilet. According to Sun-Mar, “Toilet waste typically accounts for about 30-40% of your household water output.” Some Sun-Mar models use no water at all, and the ones that do only use one or two pints per flush. Even a low flow version of a standard toilet uses about 1.6 gallons. Furthermore, there’s little to no chance of failure with a compost toilet, while septic systems are notoriously unreliable and can pose environmental risks when they leak. At this point, it might seem like I’m suddenly getting a little sycophantic about compost toilets. I don’t mean to be. I mean… I am never going to buy one. I live in a New York apartment and I would have to write A LOT more articles about compost toilets before I had enough money to hire a carpenter to build a place in the country where I’d actually consider having one. That being said … there are some nice-looking compost toilets. There are a few different models of compost toilets that each have benefits for different kinds of scenarios. But, bottom line: compost toilets don’t smell, and they look like well-made computers. Whether it’s practical to buy one or not is something for you to figure out on your own, but at least now you know that they aren’t terrifying. Thnk you for posting the article on care2. WE ARE IN MANY DROUGHTS OR WATER SHORTAGES AROUND THE WORLD. Composting toilets need to go mainstream, and turn out only clean (free of the harmful kind of -- germ and parisite and bacteria) to be put on only certian trees -- like for growing trees for paper or for lumber -- organica and sustainable tree farms. PLEASE WHERE ARE THE PETITIONS TO MAKE COMPOSTING TOILETS MANDATORY AND OUTLAW WATER TOILETS --for local, and state, or province or country or county? Composting toilets need to go mainstream, and turn out only clean (free of germ and parisite and bacteria) to be put on only certian trees -- like for growing trees for paper or for lumber -- organica and sustainable tree farms. PLEASE WHERE ARE THE PETITIONS TO MAKE COMPOSTING TOILETS MANDATORY AND OUTLAW WATER TOILETS? These are great. I really hope they become popular in my lifetime.